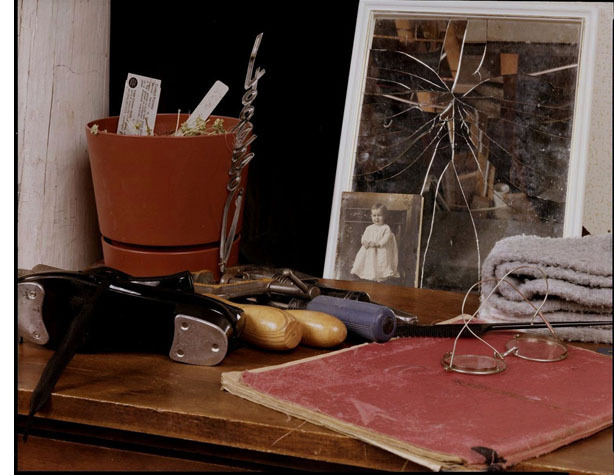 The photographs presented here are from a series called Circumstantial Evidence. This title refers to the quick judgments and opinions that a person forms in their mind, of someone else through a small glimpse into one aspect of another person's life. In this case the small glimpse is a photograph, taken of objects that were situated on the tops of dressers belonging to particular people. The reason I chose dressers for this work was that I was intrigued by the idea of a plain, functional piece of furniture being transformed into a stage, showcasing the objects placed upon it. I was also interested in the way that most dressers can be used to reflect one's personal space. Most dressers have a varied assortment of objects placed upon it. People often collect these objects in an attempt to define themselves and identify the objects they like and appreciate. On the surface these objects can identify a wide range of apparent uses, meanings and metaphors. In my photographs, I'm interested in the numerous ways that these objects can be perceived to interpret a person's character. In particular, I'm intrigued by how these objects and their arrangements become altered, which in turn changes their original meaning. The resulting identity that one portrays through these objects then becomes more open to interpretation.Each photograph is titled by the first name, age, and a brief statement about the owner. All the photographs were taken with an 8x10 inch view camera and enlarged to 4 x 5 feet. Bruce Kirton is a sessional instructor in photography at the University of Manitoba School of Art. He was educated at the University of Manitoba and received a Master of Fine Arts degree at the State University of New York at Buffalo. Kirton has shown is work in Canada and the United States, including solo exhibitions at the Winnipeg Art Gallery (1990) and Plug In ICA (1983).